This is a "must have" for citrus lovers! 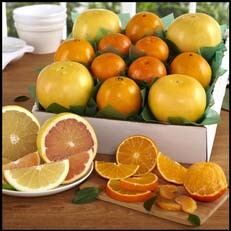 Sweet in season Oranges, sweet seedless Ruby Red Grapefruit and Tasty segment Tangerines. Packed in a special box to warn the luck recipient of the juiciness ahead!